"You Look Up To Us"
Celebrating our 29th Anniversary in business and our 21st year on the Web! Alfred Denninger, a blacksmith since 1974, and his wife Beth have combined their interest in American history and their skills in wood and metal crafts to create their unique company. Since 1988, the Denningers have been decorating the finest buildings throughout the United States and six continents around the world with their American Folk Art. Many of the techniques which Al uses in his shop have remained unchanged since the 18th century. His talent lies in his ability to combine these primitive techniques with state-of-the-art technology. Beth and Al keep an extensive library and photograph file of antique rooftop embellishments and continually study architecture and design. The Denningers work carefully to create the decoration which best reflects the client's lifestyle, the personality of a home or business or the accurate restoration of an historic building. 100% of our weather vanes, finials and components are proudly Made in America. Our interest is in the highest possible quality. We will not sell any imported imitations. 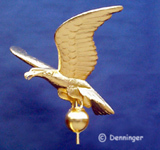 Click here for a list of the dozens of magazines, newspapers and periodicals that have featured Denninger Weather Vanes & Finials. Just what is a weather vane? What the heck is a finial and where would you find one? What is a cupola. . . and how do youpronounce it? A brief history of weather vanes. The Weather Vane News - news from around the world on weather vanes. 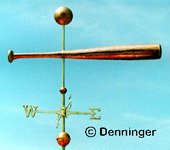 A free service from Denninger: The Antique Weather Vane Marketplace- for people who want to buy, sell and collect antique weather vanes. Museums and historical buildings where you can see antique weather vanes. All contents © 1988-2017 AHD. All Rights Reserved. We have had well over 2 million hits in the past 21 years on the web.